Wiregrass Breaking Barriers Summit 2018 – THANK YOU TO EVERYONE WHO TOOK PART! WHAT IS THE WIREGRASS BREAKING BARRIERS SUMMIT? Are you a medical or behavioral health provider, social worker, case manager, or health advocate in Alabama or the U.S. South? Join hundreds of your colleagues as we examine the changing landscape of HIV and HCV in Alabama and beyond. 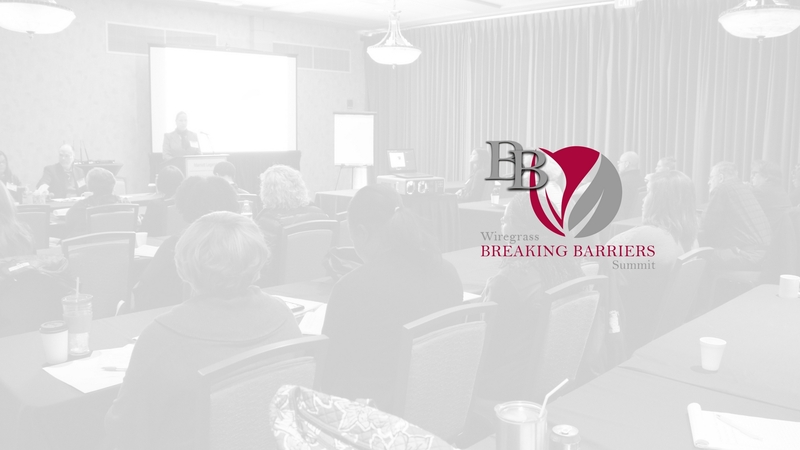 The Wiregrass Breaking Barriers Summit is a single-day conference to empower those who are empowering others through care and prevention activities in the U.S. South’s rural communities. CE credits, professional presenters, networking opportunities, and health-supporting exhibitors all in one place. For some, the Wiregrass Breaking Barriers Summit serves either as an extended learning opportunity for participants of the larger, multi-day Breaking Barriers Summit held annually in January or February, or as an opportunity to experience part of the Breaking Barriers experience later in the year or closer to their service area in the Southeastern corner of Alabama, and nearby parts of Georgia, and Florida. Participation is worth 6.5 hours of continuing education for counselors, social workers, and others. 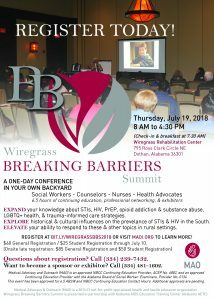 Topics for the 2018 Wiregrass Breaking Barriers Summit will include: the latest facts about STIs, HIV, and PrEP; cultural influences and considerations of care; LGBTQ+ heath; opioid addiction and substance abuse, particularly known relationships to other health risks; and behavioral health strategies and observations with regard to trauma-informed care. Medical Advocacy and Outreach (MAO) is an approved NBCC Continuing Education Provider, ACEP No. 6882, and an approved Continuing Education Provider with the Alabama Board of Social Worker Examiners, Provider No. 0134. This event has been approved for 6.5 ABSW and NBCC Continuing Education Contact Hours. Additional approvals are pending. 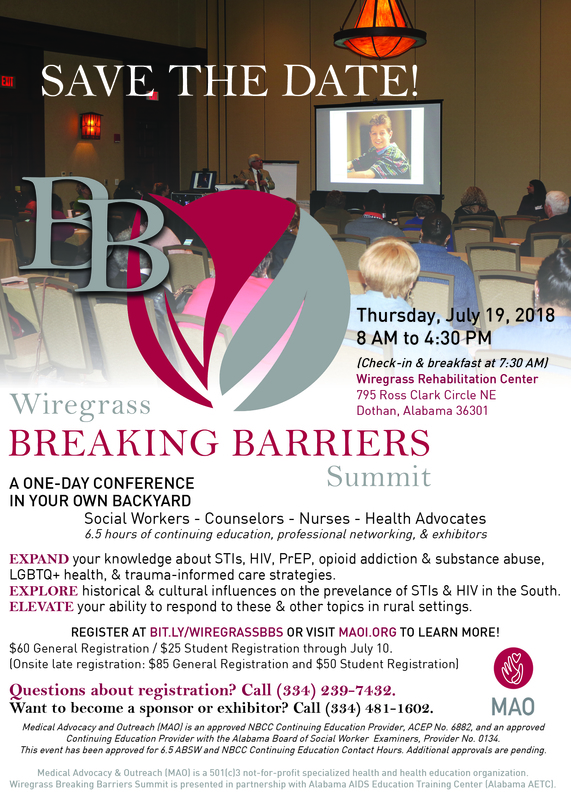 IF YOUR BUSINESS OFFERS SUPPORTIVE SERVICES AND MATERIALS TO PROVIDERS, ASSISTANCE SERVICES FOR THOSE IN NEED, OR QUALITY OF LIVING OPTIONS, CONSIDER BECOMING A SPONSOR OR EXHIBITOR FOR THE 2018 WIREGRASS BREAKING BARRIERS SUMMIT. START BY DOWNLOADING A SPONSOR/EXHIBITOR INVITATION PACKET TODAY. CLICK HERE!